Prominent & Leading Manufacturer from Ahmedabad, we offer vaccumerated sifter 36", vibro sifter 30", vibro sifter 20", double deck vibro sifter 48", double deck vibro sifter 36" and double deck vibro sifter 30". Output will be approximate 150 to 300 kg/hour and it’s depending on size mesh size, material density & its characteristics. Output will be approximate 50 to 100 kg/hour and it’s depending on size mesh size, material density & its characteristics. 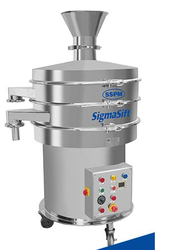 Double Deck Vibro Sifter 48"
Silicon molded lead free Sieves with detachable design to accommodate user’s requirement. Double Deck Vibro Sifter 36"
Double Deck Vibro Sifter 30"
Double Deck Vibro Sifter 20"
Double Deck Vibro Sifter 12"
Looking for VIBRO SIFTER DOUBLE DECK ?